My new program Antah Prerna – A Musical Telling of an Entrepreneur’s Journey debuts in July 2018 at the Bangalore International Centre. Antah Prerna is a musical telling of an entrepreneur’s journey. The multimedia project explores the journey of an entrepreneur from idea conception all the way to success and growth (or even an exit). It features an entrepreneur (or two at times) as the sutradar (narrator) and music from across India, that takes the audience through each stage of the roller-coaster journey – from the inspiration, through naysayers, exhilaration and numerous setbacks and inevitable self-doubt. Smita and Ram, co-founders of RangDe, will narrate their entrepreneurial journey for this launch edition of Antah Prerna. I’m working with an Irish entrepreneur to bring this program to the Midwest (USA) next spring and we know that the Irish are great storytellers! Watch this space for further updates. Even as I’ve continued to perform classical carnatic kutcheris, I’ve been creating thematic projects, with the idea of bringing classical music to a wider audience. 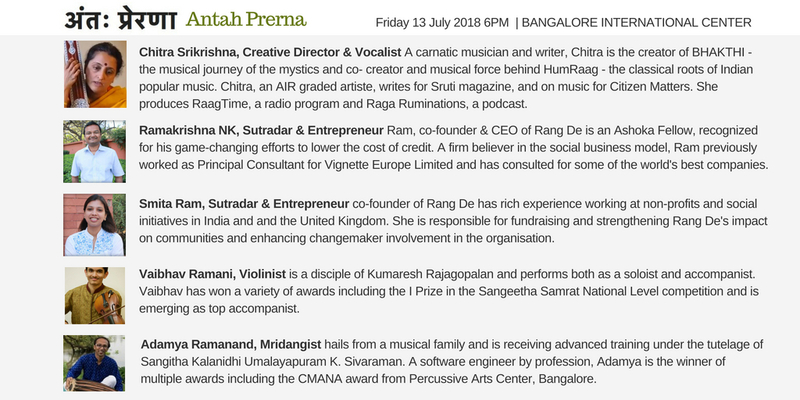 Antah Prerna is the third in a series, that began with HumRaag – the classical roots of Indian Popular Music – a co-creation with writer Shoba Narayan which debuted in 2014, and was well received in numerous performances across India. The second one, BHAKTHI – A Musical Journey with Mystics debuted in the US in 2016 and was anchored by a live performance of songs of Indian Bhakthi saints in different languages, interspersed with short narration and accompanied by a visual presentation. I’ve continued to tour with BHAKTHI in the US and India.